Easily carried by two men, effective range about 1,000 yards, HE fragment rounds' killing radius 17 yards, usually deployed one per rifle platoon, very efficient in weight compared to destructiveness, the M2 60mm mortar was the Infantryman's artillery. It often made the difference. 60mm M2 Mortar deployed on Recon Patrol to protect against overnight assault. Central front, May 1951. A Marine Mortar Platoon from Inchon through the Chosin Reservoir. Joe says 60 crews had it easier than rifle platoons in winter fighting such as Chosin, since they quickly ignited small cooking fires with unused powder increments. Joe adds that the 60's also enjoyed a few minor extras of cigarettes and fruit rations by trading some of those increments. The more the action, the more unused increments, so these transactions would come when most needed all around. Weight: 42 lbs assembled; barrel 12.8 lbs; bipod 16.4 lbs; base plate 12.8 lbs. Most widely used, 3.07 lbs, range max 2,000 yds; effective range up to about 1,000 yds due to dispersion, produces over 200 fragments, with an effective bursting radius of 17 yards. weight 4.02 lbs, muzzle velocity 439 fps, both a smoke producer and a casualty-inducing weapon. Weight 3.7 lbs; length 14.28 in; range max 1,000 yds; height about 800 feet; parachute attached, falling about 10 feet/sec; illuminate burned about 25 seconds, producing 110,000 candlepower, illuminating an area of about 100 yards diam. Consist of square powder increments and an ignition charge. The full charge consists of an ignition cartridge and four equal propellent increments (bundles of sheet powder, in waterproof cellophane bags) assembled to the base of the round as issued. The increments are fitted into slots of the fin blades. To prepare the charge for firing, it is only necessary to remove any increments not required for the range desired. For mobile platoon and company level action, an easily portable weapon for use between the effective ranges of hand grenades and the 81mm mortar was needed. Hence, the 60mm M2. The bipod was often left attached to the tube for speed in bringing the mortar into action, and the combination was readily carried by two men, with ammunition in complete rounds being carried by supporting troops. In the Marine Corps, our 60mm guns were usually in three gun-squads in a 20-man mortar section commanded by a lieutenant, reinforcing each Rifle Company. Each gun-squad consisted of a squad leader, gunner, assistant gunner and 3 ammo bearers. In deployment for action, the ammo carriers humped 6 loads, in addition to their weapons and equipment. On the move, the gunner carried the complete mortar w/o sight, and all other men carried ammo bags or packboards strapping 12 loads. In addition all men carried their equipment and a carbine, and the squad leader carried the M4 sight. These guns were invaluable in close support. Sometimes in battery, but usually assigned one gun per platoon, they moved fluidly close behind our assault troops, and registered on assault lanes in front of the platoons before night, so as to be ready to quickly provide murderous close support. 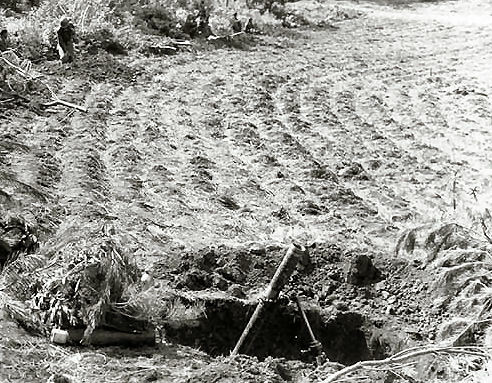 Infantry mortars are normally employed in defiladed positions, such as the reverse slope of a hill or ridge, so as not to be vulnerable to enemy direct fire positions. Hence direction and altitude settings are normally controlled indirectly by a forward observer, or an aiming stake about 10-25 yards forward of the gunner, and the rounds are normally dropped down the barrel. The 60mm M19 could be used as a direct fire weapon by attaching the small M1 base plate to the barrel. 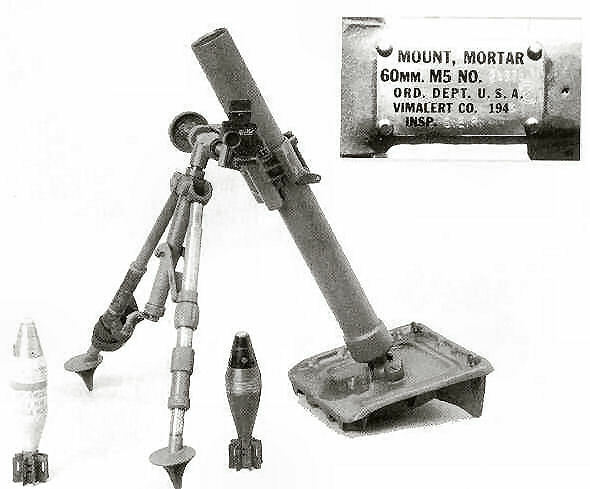 This reduced the mortar weight substantially, and greatly lowered the weapon profile in the open during fluid engagements where targets were close and in direct view.In such situations, however, the recoilless rifle or bazooka were usually more effective. Comparing weight of material to destruction delivered at the target, mortars are very efficient. "The infantry's artillery", they provide small infantry units artillery-like fire support when artillery either was not available, or could not be moved forward fast enough. The initial Chinese Communist assaults of November and December 1950, did not bring artillery, but they did bring mortars, and used them with great effectiveness. Typical CCF assault tactics were to drift strong infantry units near our lines at night, and use small probing attacks to locate our automatic weapons and machine guns and, if possible, junctions between our platoons or other weak points. Then, they would attack in strength with platoons armed only with grenades, followed by submachine gun platoons. Their light mortar units would follow quickly, and place their fire on our strong points from fairly close distances, enabling them to fire with reasonable accuracy even though at night and without prior registration.